No, this was not a fan-fiction mashup video from YouTube. This is the weird, twisted, horror-film-esque work of Finnish artist Kim Simonsson, on display at the American Swedish Institute through July 15. Simonsson, who lives in the town of Fiskars (of scissors fame), an artist enclave west of Helsinki, has carved out something of a niche with these haunting childlike warriors, or “shamans,” as he calls them. Arranged in various rooms of the institute’s 110-year-old mansion, each creates its own creepy scenario. 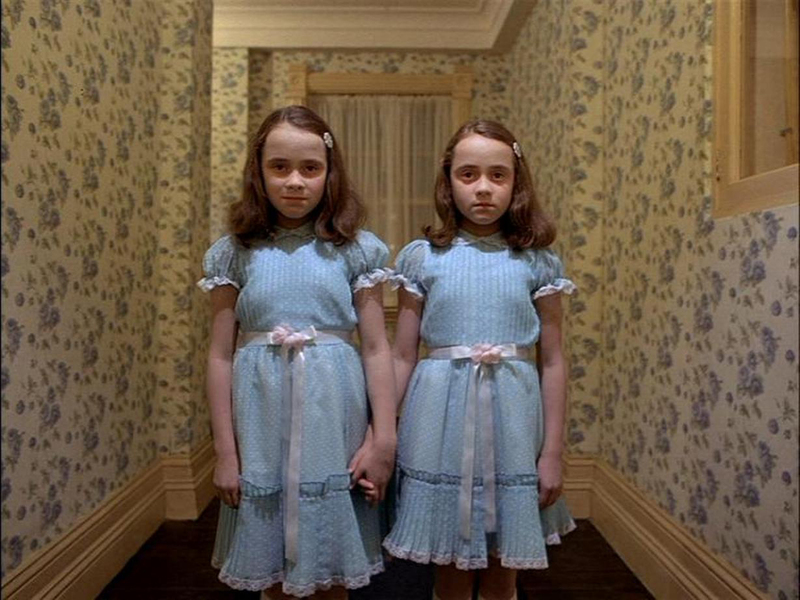 A set of twins, “Lisa and Louise” (2016), actually stand at the end of the hall much like the ones from the Stanley Kubrick film “The Shining.” Except they are ceramic sculptures, not ghosts. Still, their presence is haunting. All of the children, and the occasional adult woman, are either made of smooth, white ceramic or covered in a fiber that looks a lot like bright green moss. With nearly 40 objects in all, this is the largest exhibit of Simonsson’s work to date. They are making their presence known in the old mansion. When: 10 a.m.-5 p.m. Tue., Thu. & Fri.-Sat. ; noon-5 p.m. Sun. ; 10 a.m.-8 p.m. Wed. Ends July 15. Where: American Swedish Institute, 2600 Park Av. S., Mpls. “They take over,” he said, matter-of-factly as we stood staring at a 3-foot-tall ceramic girl standing atop a mirrored table. Her arms are extended like airplane wings. It appears she’s about to jump. “Girl Jumping in Tile Puddle” (2016) is her name, and actually she is not moving at all. Instead, we are drawn to her look of determination, as well as her reflection in the mirror tabletop. Simonsson is well known in Finland, having won the 2012 William Thuring Prize and the 2004 Young Artist of the Year Award. He’s had solo exhibitions in Paris, Denmark, Belgium, New York, Berlin and Stockholm. This is his first show in the Midwest. Inspired by manga, pop culture, fairy tales, film and art history, Simonsson found himself interested in the history of figurative porcelain, which favors realism. He messes with that genre, crafting characters and scenarios that cast a disturbing, otherworldly glow. That’s how you’ll feel when you encounter “Swanserpentkiller” (2008) hanging out in the kitchen. A ceramic girl with short, fettucine-like hair stands holding a swan’s severed, scaly, serpent-like head, its eyes glowing red, its lifeless body on the floor behind her. And though she has captured and killed this evil mythical “beast” that Simonsson completely made up, her eyes are red, too. Other characters are more in awe of the animals they encounter, like “Moss Girl and Twoheaded Rabbit” (2018), a girl sitting down on her knees, her left hand gently outstretched toward a two-headed rabbit standing in front of her. This girl is part of the vast Moss People series that Simonsson has been working on for three years. Many are on view in the white-walled Osher Gallery of the institute’s newer building, positioned on black podiums as if they were clothing models for Gap Kids. Except they wear decorative feathers — Simonsson said he was inspired by a video he saw at the Lyon Biennale in France of an African man in a feather-mask, dancing for his village as part of a way to rid himself of an anger problem. He uses a very neat flocking technique to apply tiny, colorful nylon fibers to his sculptures. First he coats the sculptures in black epoxy, then applies an electrostatic charge that causes the fibers to adhere to the paint — like hair on skin, he says. Strangely, neon-yellow fibers combine with the black epoxy to form a greenish, mossy surface. Simonsson is a man of few words. Instead, his sculptures offer up singular emotional experiences. In “Camouflage” (2012), a girl becomes so nervous in front of the other kids in a classroom that her body has become the same color as the chalkboard. We all remember those moments in school — some of us more vividly than others. She’s a warrior in her own right. A quarantine at two Los Angeles universities affected more than 200 students and staff who may have been exposed to measles and either have not been vaccinated or cannot verify that they are immune. An important pretrial hearing in Harvey Weinstein's sexual assault case could play out in secret if a judge rules against news organizations fighting to keep the courtroom open.